Today was a long day of driving today, with a couple of stops along the way. I’m too tired to exude my usual effervescent narrative, so I’ll let the pictures do the talking in this short post. First stop: the Myvatn thermal baths. You may have heard of Reykjavik’s famous Blue Lagoon, and this is that, minus the “Blue” part and about half the admission fee. It’s a natural thermal spring with a large wading pool architected around it; its temperature varies somewhat from place to place within the pool but averages about 39 C (102 F). Here’s the scene, plus Alice, Tim, Janet, and a complete stranger in the background enjoying it. We were still in Geothermal Mode for our next stop, the Hverir mud pots, basically a scale model of Yellowstone. There’s a short walking path around the area, lined with boiling mud, fumaroles, cracked mud fields, brightly colored mud, and, well, mud. It’s a fun place to visit for perhaps a half hour unless you are ambitious enough to hike up to the top of adjacent Namafjall mountain. We weren’t. Rising above it via drone gives an even more majestic perspective: the color goes on for miles, with nary a car in sight. I’ll post a video of the drone flight later, but for now, to end today’s post, here’s a striking drone’s-eye view from about 100 meters up. You can see that the road is not so great, but the vista makes up for the bumps. OK, I want to be clear here. In the United States, the petrol pump with the green handle is always diesel. Always! Am I right, or am I right? I thought so. And so my error was not only forgivable, but unavoidable. Unavoidable, I say! But I am getting ahead of myself. We left Reykjavik at about 10 AM today, en route to the north, to the area around Borganes, a small town on one of the western fjords of the country. Our specific destinations were a lava cave and a couple of well-known waterfalls in the vicinity. But first we needed to fill the tank of our thirsty 4WD behemoth, a double-cab Isuzu pickup truck with an enclosed bed for our luggage. There was a gas station just around the corner from the flat, a brand called Olío. (Notice the accent over the letter i, which gives it a long i sound.) Our vehicle requires diesel fuel, which I noticed that all the pumps offered. So I drove up to the first pump, inserted my credit card, and engaged the pump with the green handle since that is OBVIOUSLY DIESEL FUEL. I pumped about 40 liters — costing approximately 12 million dollars US — as Tim and I congratulated each other on our manly ability to pump gas in a foreign country. (By the way, for the record, petrol actually costs roughly US $9 per gallon here.) But as I hung the pump back in its cradle, my eye was drawn to an adjacent pump handle — stealthy black in color — with a tag on it that, in ominous Icelandic, read “Díesl”. By virtue of my highly advanced linguistic skills, I immediately realized that, in NASA parlance, I had screwed the proverbial pooch. In particular, I had just put about 40 liters of 95-octane petrol into a diesel vehicle. The only saving grace of the situation was that I had noticed this before we had set out on our drive and inevitably broken down in the middle of some godforsaken windswept glacial tundra, which is where it surely would have happened. But since we were still at the petrol station, the potential catastrophe had been reduced to what Alice and I refer to in our travels as an “MSP”, which stands for “Money-Solvable Problem.” I went to the counter of the service station, where the friendly attendant called a local guy who handles this sort of thing. Said local guy, a creased, windburnt, businesslike 60-something in coveralls, showed up about 20 minutes later, siphoned out the contaminated fuel, and — because we had called him from home on a weekend — somewhat apologetically charged me an amount of money that was shockingly much even by Icelandic standards. Like I said, an MSP. We refueled the vehicle — another 18 million dollars of “Díesl” this time — and, this particular misadventure behind us, set out on our away again. Our route to the lava cave first brought us past Borganes and its adjacent fjord, bordering a scrubby green and yellow steppe at the foot of a line of steep volcanic mountains. Despite the bleakness — it was an overcast, windy day with a smattering of rain — there was a certain stark idyllic quality to the setting, as you can see from scenes like this. The bridge at lower left leads directly into Borganes. But although we are sleeping there tonight, our lava cave of interest lay about a 45 minute drive beyond it. The cave — actually a lava tube — is called Víðgelmir, which like many Icelandic place names is best pronounced whilst eating a marshmallow. It sits in the middle of a lava field at the foot of the Langjökull glacier, which you can see here. The cave is more than 30 meters underground with assorted ledges and overhangs, so we were first equipped with helmets with mounted flashlights. As you can see from this photo we were ready for some volcanic spelunking. The entrance to the cave is suitably maw-like, and we picked our way along the, um, unadventurous wooden stairs and boardwalk, following our guide and listening to his lecture about the geology of the place. We are not unfamiliar with lava tubes because of our time in Hawaii, but Víðgelmir is particularly impressive. It’s nearly a mile long and sports a variety of lava formations much more typical of a “conventional” limestone cave, e.g., stalactites and stalagmites, albeit very small ones. But its most (to me) unexpected feature is a consequence of its temperature, which hovers at just about freezing. Consequently there are a large number of crystalline stalagmite-like ice formations like these. I found them particularly otherwordly. And indeed, if you get too close they break open and this thing that looks like a horseshoe crab jumps out and grabs your face, and you just know what’s gonna happen after that. You can tell from the photos how gray the sky had gotten, and in fact it was pretty much pouring by this time. So we gawked until satisfied, then retreated to the car and returned to Borganes. Our lodgings are an AirBnb, a very pleasant two-bedroom cottage overlooking the fjord. Borganes has a population of only about 3,000 but I am happy to report that we were able to satisfy Janet’s craving for pizza: there are at least two pizzerias in town, and the one we chose was excellent. Tomorrow: further into the frozen north! I mentioned yesterday that the Finger Lakes were formed during the last ice age and are thus quite young: a few tens of thousands of years. But they have company, in the form of a number of spectacular narrow gorges. The best known of these is Watkins Glen at the foot of Seneca Lake. It’s an insanely photogenic canyon, 400 ft (120 m) deep and about a mile and a half (2.5 km) long. 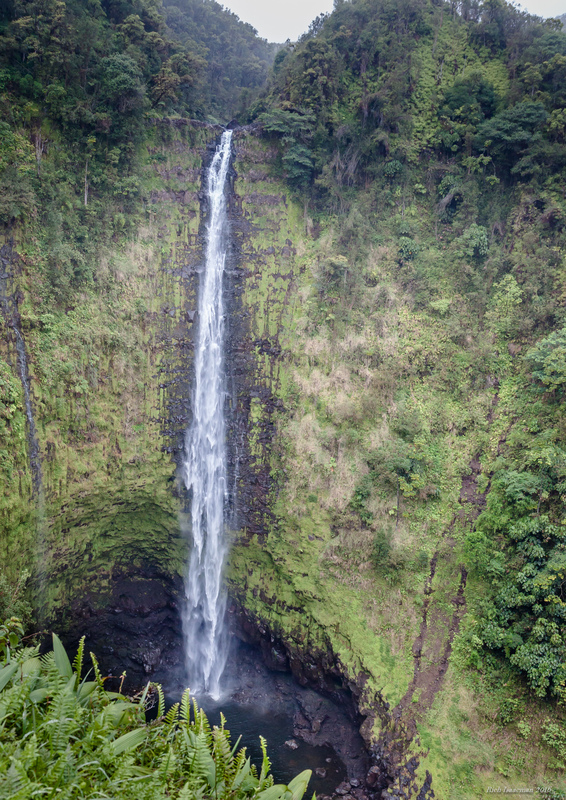 If you walk the whole length — we did about half — you’ll go up and down something like 890 steps, and you’l see 19 waterfalls. The geology of the gorges is interesting. They are sedimentary rock, a mix of shale, limestone, and sandstone. These differ a great deal in their hardness and thus their rates of erosion, resulting in a number of natural staircase-like rock formations. At home we are avid if not particularly ambitious kayakers, and since Kauai is the only one of the Hawaiian islands with navigable rivers — six of them, supposedly — it seemed reasonable to find a riverside kayak rental outfit. 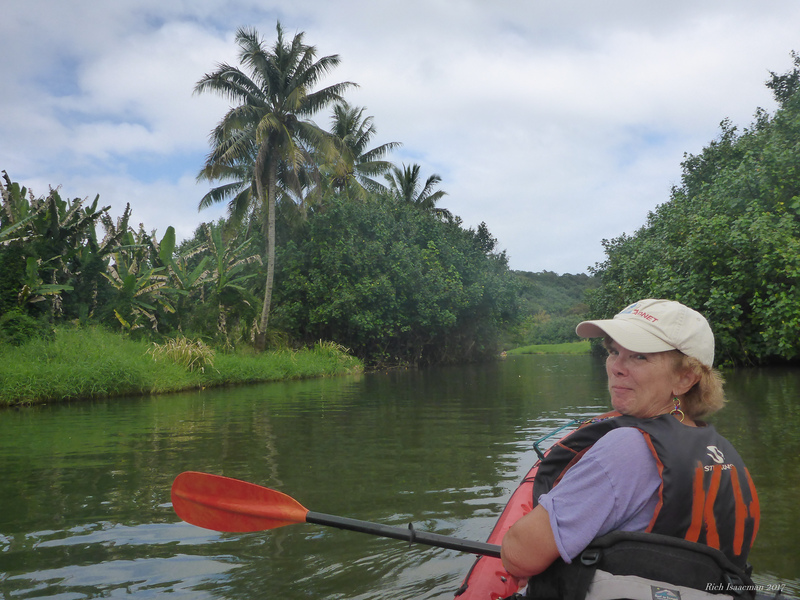 Such a place existed, quite close to us in fact, and so we spent a pleasant three hours kayaking on the Hanalei River, beginning about a mile from Hanalei Bay and working our way upstream to a nature reserve a few miles away. The experience was, as I remarked in a Facebook post, just like kayaking at home except for the palm trees, the hibiscus blossoms floating on the water, and the whole laid-back tropical gestalt of it all. We did not see a lot of animal life in the nature reserve — a few fish, some turtles, a few egrets — but gliding among the palms and pandanus trees and spotting modest mini-waterfalls along the banks gave the whole experience a pleasantly dreamy ambience. If the lighting looks a little unusual in this picture it is because it is actually a nighttime scene, a twelve-minute time exposure taken by moonlight… hence the creamy, blurred-looking surf. But back to the birds. 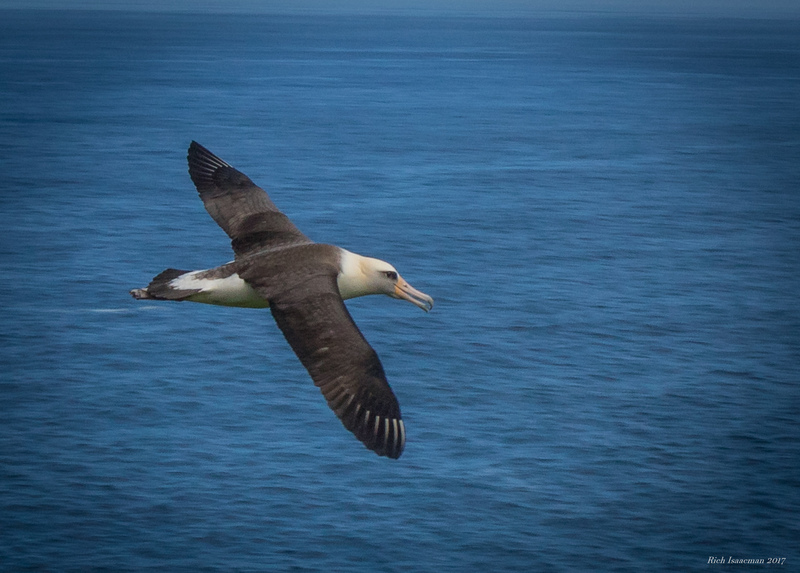 The red-footed boobies, thousands of them, look like white confetti on the far hillside, but close up resemble ungainly seagulls with enormous red feet and blue bills. You can see them as white dots at upper right in the shot below. (You can also see that you would not want to swim here.) We have seen their more famous cousins, the blue-footed boobies, in the Galapagos. 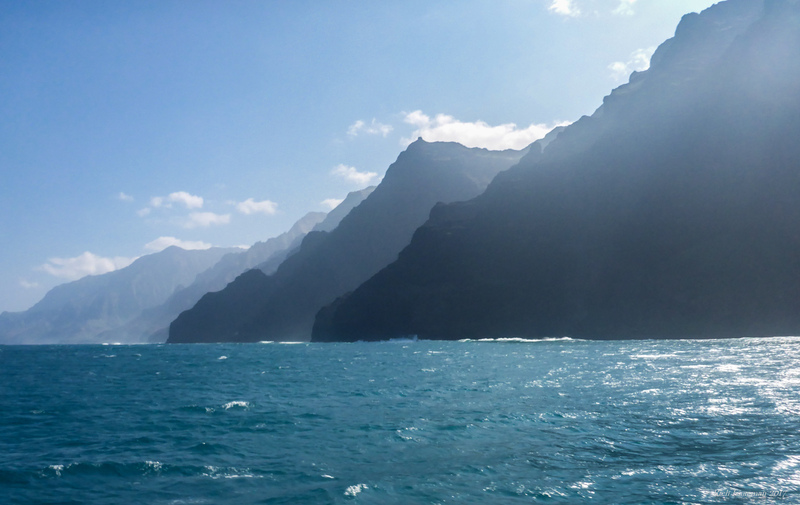 The next day (yesterday, Saturday Feb 4) was our opportunity to complete the geographical trifecta, as the day dawned clear and we got to see the Na Pali coast from the sea. (We had already seen it from the hiking trail lookout and via helicopter.) Our tour operator, Na Pali Riders, were quite the cowboys, leading about 20 of us into what was essentially a large Zodiac, a rubberized pontoon boat right at the water level, powered by twin 250 HP motors. That thing could move, and with the trade winds coming up and the surf high, the ride was anything but smooth. How bone-shatteringly bumpy was it? Well, in addition to a rope handhold running along the edge — and you sit on the edge — there was a rope foothold around the perimeter of the floor. You keep one foot slid underneath it to keep you from bouncing backwards into your own personal whale-watching adventure. That’s Mom’s pectoral fin on the right, the baby breaching on the left. Notice that baby is flopping over on his back: that’s how whales actually do it. 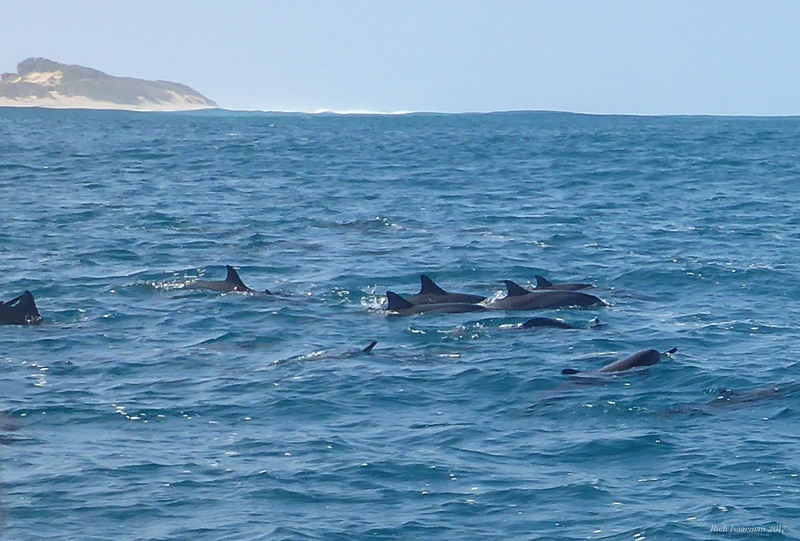 So here are two more shots, ’cause you can never have too many whales. 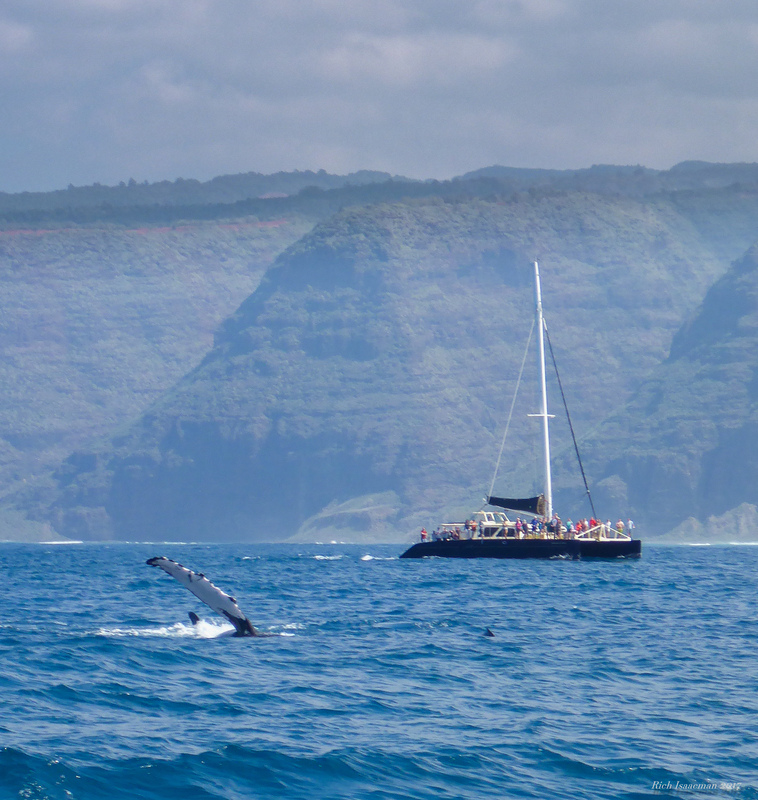 The whales were clustered near the southwest corner of the island, a little south of Na Pali itself. 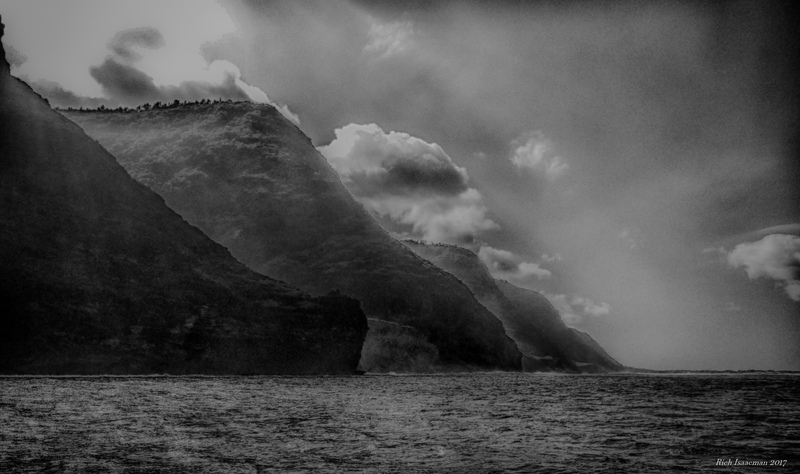 So we motored up the coast to catch these striking scenes, which I promise will be the last ones I show you of Na Pali. We’ve already had the Jurassic Park discussion, but if it all looks a little “Skull Island”-ish to you, there’s a good reason for that too: the 1979 remake of King Kong was filmed here. But probably the surrealistic best of the B-list sights is the “Russian Fort”, which we visited briefly. Very briefly. Still, its history is so weird that it is worth relating. Kamehameha I unified the islands under his monarchy in 1810, but unsurprisingly not everybody got with the program immediately. Chief among these (hah! get it?) was Kaumuali’i, who ruled Kauai and much preferred doing his own thing. This included seizing a cargo ship belonging to the Russian-American Trading Company in 1815. The Russians were none too pleased at this and dispatched an agent, a German physician named Georg Schäffer, to free the goods. Schäffer figured his best play was to befriend Kamehameha and then convince the latter to pressure Kaumuali’i. The befriending part worked OK… the pressuring part, not so much; Kamehameha didn’t see much upside to antagonizing his disgruntled underling on behalf of a guy who looked like the Wizard of Oz. So Schäffer went straight to Kaumuali’i, who promptly conned him. Kaumuali’i convinced Schäffer that if the Russians would build a fort, they could seize the entire island chain from Kamehameha. Schäffer promised the Tsar’s support, and had the fort built. Then things went predictably sideways: (1) upon learning of all this the Tsar said, “WTF?”; and (2) what Kaumuali’i was really planning, of course, was to take the islands for himself (“We don’ need no steenkin’ Russians!”). So the whole endeavor collapsed, Kamehameha’s supporters took over the fort, and after a halfhearted attempt to retake it several years later, Kaumuali’i’s guys threw in the towel. 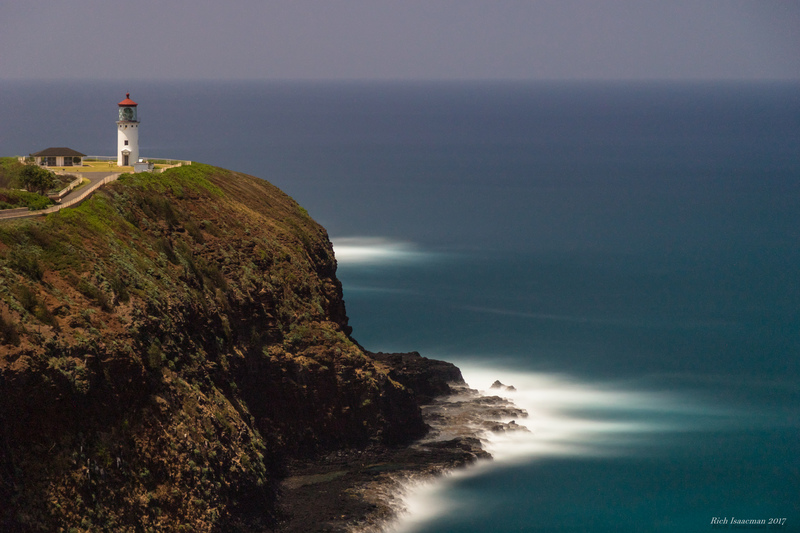 The place was abandoned in 1853 after decades of proudly defending Kauai against, well, nothing. Today it’s a rock wall about shoulder-high (about 1/4 of its original height), tracing out a rough octagon a few hundred feet across. We were positively rapt for about 3 seconds. I never did learn what was on those cargo ships, but in the interest of adding some irony to the whole bizarre tale I like to imagine that it turned out to be something of absolutely no use to the Hawaiians. Fur-lined mittens and frostbite ointment, say. You can think of your own. Today was our last day on Kauai. The weather was beautiful, and so we made the precarious hike down to Queen’s Bath on the coast. I’ll post some photos of that in a few days. But for now, on to Honolulu. 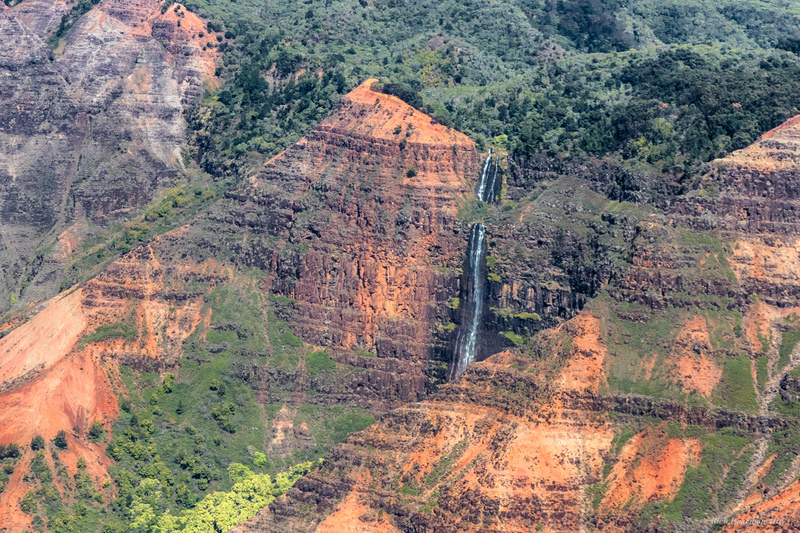 Yesterday was Helicopter Day for us, that means of transportation being far and away the best way to get a real sense of the geography and vegetation of Kauai. We woke up with the chickens. I do not mean by this that we woke up early; I mean we literally woke up with the chickens. There are *&%^$# chickens — that is pronounced “frickin’ chickens” — absolutely everywhere on Kauai: on the roads, on the sidewalks, on the golf courses, underfoot. Today we had lunch at an outdoor food court where, for very good reason, there was a sign posted that said “Please Do Not Feed The Chickens”. I have no idea why, but the island is plain crawling with chickens. (Hmm. Somehow “crawling” doesn’t seem like the right word when discussing chickens. But “scratching with chickens” doesn’t sound right.) 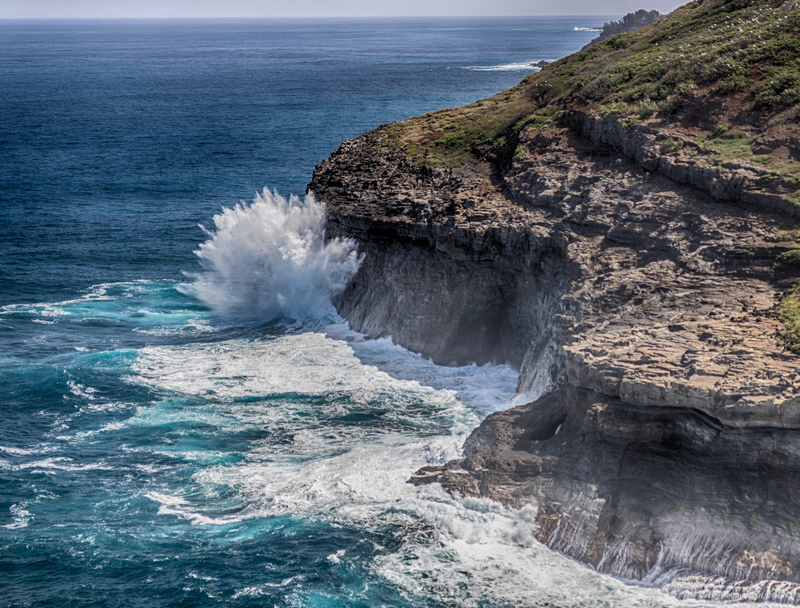 The consequence of all this is that there are three constant sounds that form the backdrop of life on Kauai: the surf crashing (dramatic! ), the suserration of the wind in the palm trees (soothing! ), and the ubiquitous roosters crowing (um…). 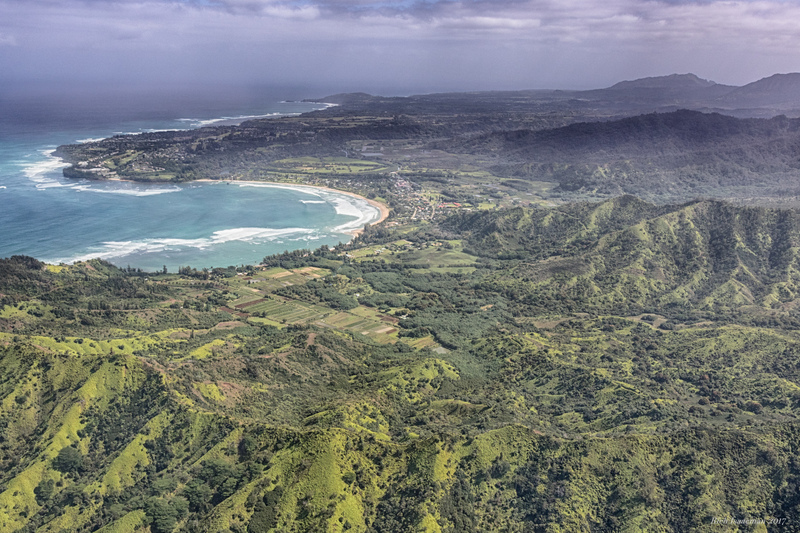 Looking east towards fabled Hanalei Bay. Our B&B is on the north shore (leftmost point) of the peninsula. The flight took a little under an hour. 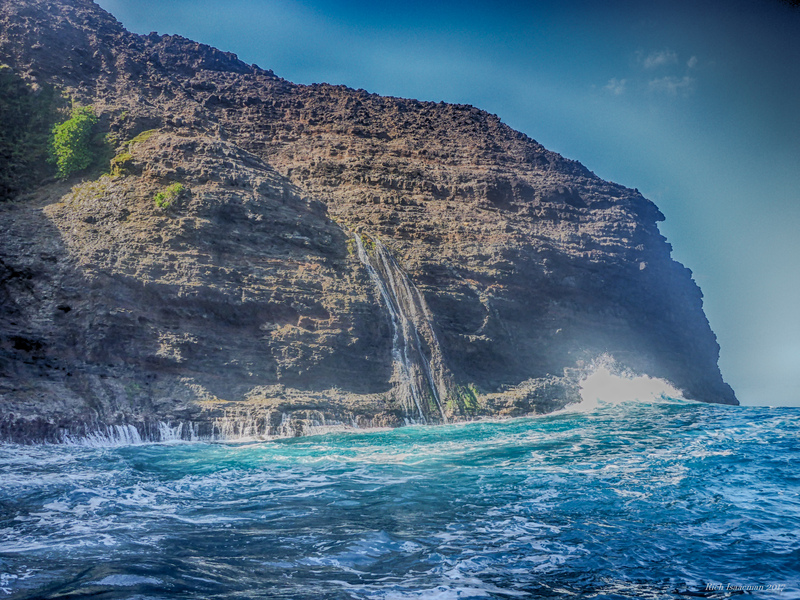 The sights along the way included some of the venues where “Jurassic Park” was filmed. Though very much younger than the Grand Canyon, it was formed by a similar erosive process. In the Grand Canyon’s case, that would be the Colorado River; Waimea Canyon was formed by rain runoff from 5000′ Mt. Waialeale, the second-highest peak on the island and purportedly the rainiest spot on the planet. Mt. 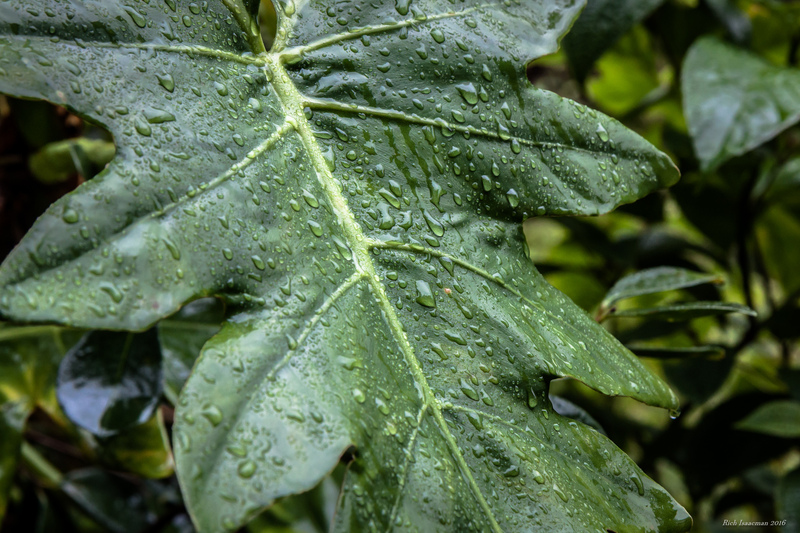 Waialeale averages roughly 14″ (35 cm) of rain per day. You do not want to plan a picnic on Mt. Waialeale. 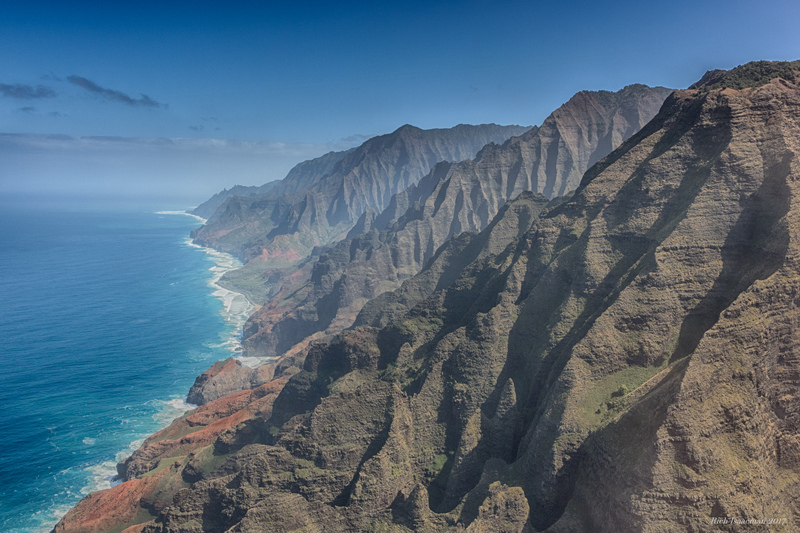 We snaked back down the mountain and continued our clockwise course until the road petered out altogether near Polihale State Park, at the westernmost point of the island. The beach there is spectacular: an endlessly long, broad, and flat expanse of coarse pale orange sand, terminating at the Na Pali cliffs a few miles to the north. On calm days, the water is so clear that you can see the sand being sucked up off the bottom by gentle waves as the rollers come close to shore. But that is not a sight for winter, when the surf is ceaselessly punishing. The main problem with Polihale is getting there, since the last 4 miles of the road isn’t a road at all, but rather a spine-jangling washboard surface of packed dirt and small craters. You are not allowed to take rental cars there, and certainly not our rented Nissan Versa, which appears to be made out of aluminum foil. So I would like to state for the record that we were transported by a giant eagle, like Gandalf in “The Hobbit”. Yep, looks forbidden to me all right. 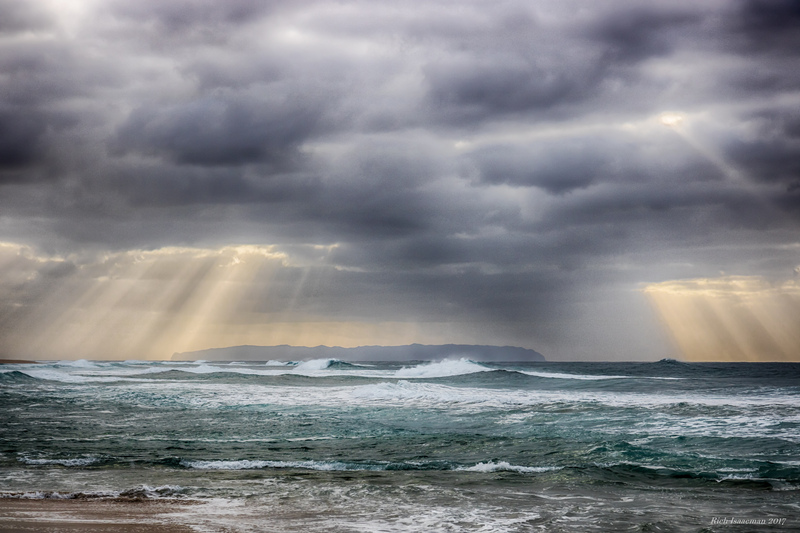 But the reason Niihau is called “forbidden” is not because the ancient gods will smite you if you land there, the above photo notwithstanding. 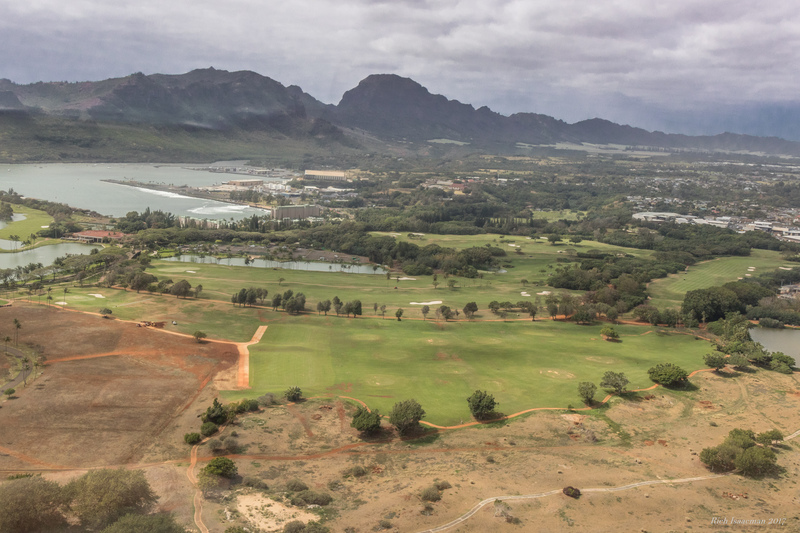 No, you will be smitten by the lawyers from the Robinson family, a venerable clan of major Kauai landowners who own Niihau outright and maintain it as a preserve of Hawaiian culture. 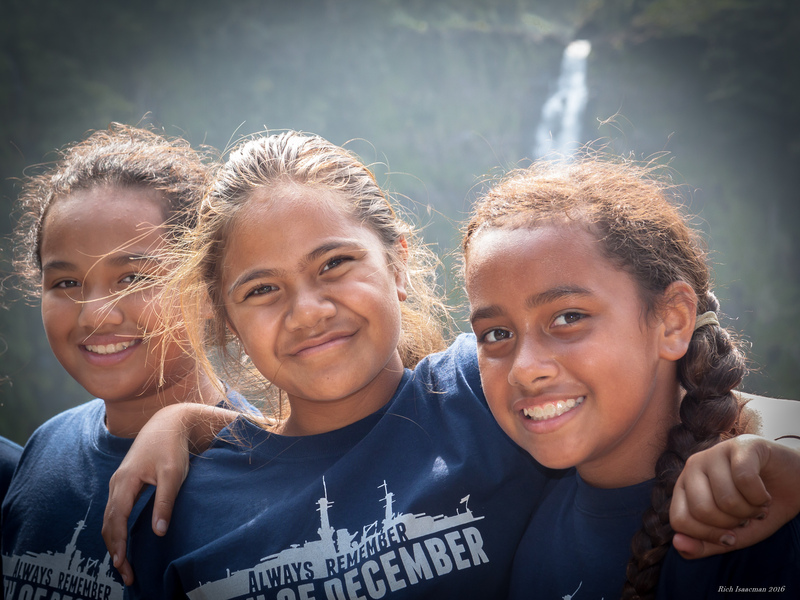 The residents are of native Hawaiian blood — among the very few left — and the primary language of the island is Hawaiian. Tourism is by and large forbidden, though there are a small number of special permits issued. The Robinsons also have an arrangement with the Navy, which maintains a small unmanned facility there which they occasionally use for training exercises. How did this come about? The answer, simply enough, is that in 1864 a wealthy woman named Elizabeth McHutchison Sinclair flat-out bought the island from Kamehameha V for $10,000 in gold. It passed down through the family and in 1915 her grandson Aubrey Robinson closed it off to visitors. Aubrey’s grandsons own the island today, along with significant swaths of Kauai itself. I’ve mentioned Na Pali a number of times on this leg of the trip, not unreasonably because it is a genuinely extraordinary sight. We have so far seen it on foot during our hike two days ago, and yesterday by air. We were supposed to have completed the trifecta by taking a boat trip to it earlier this afternoon, but the excursion was canceled because we were the only people who signed up. We have rebooked it for Saturday, so stay tuned for yet more pictures of the place. 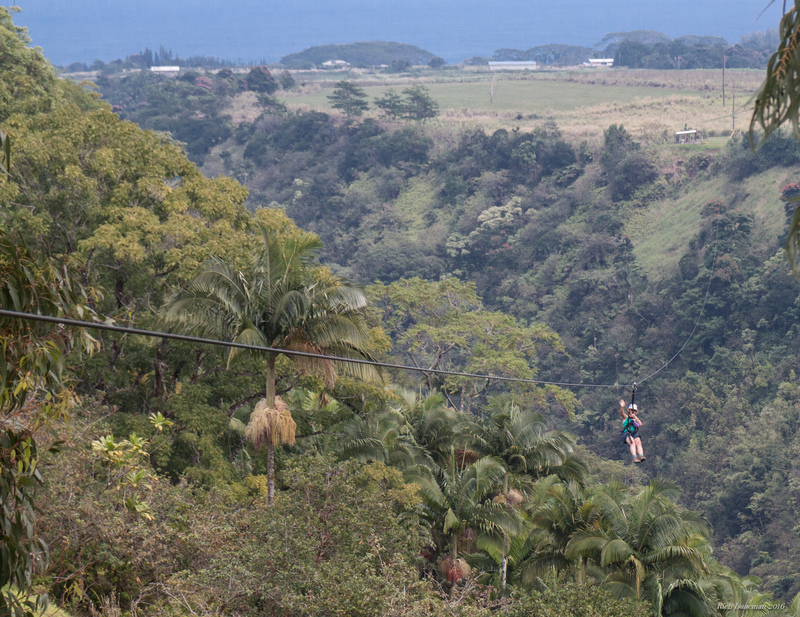 Ziplines have become quite the fad in the last 15 years or so, which postdates the era that I lived on the Big Island. 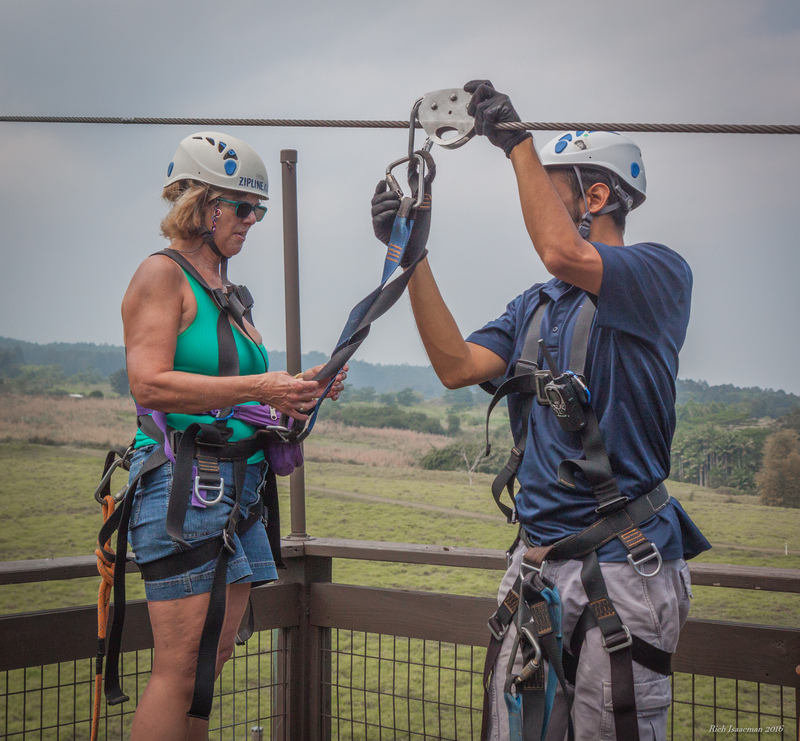 But the local tourism industry has caught up, of course, so Hawaii ziplining is now a thing. Which I suppose is good, since (a) it’s relatively eco-friendly and (b) heaven knows there are enough scenic venues here that are worth looking at whilst suspended on a steel cable. 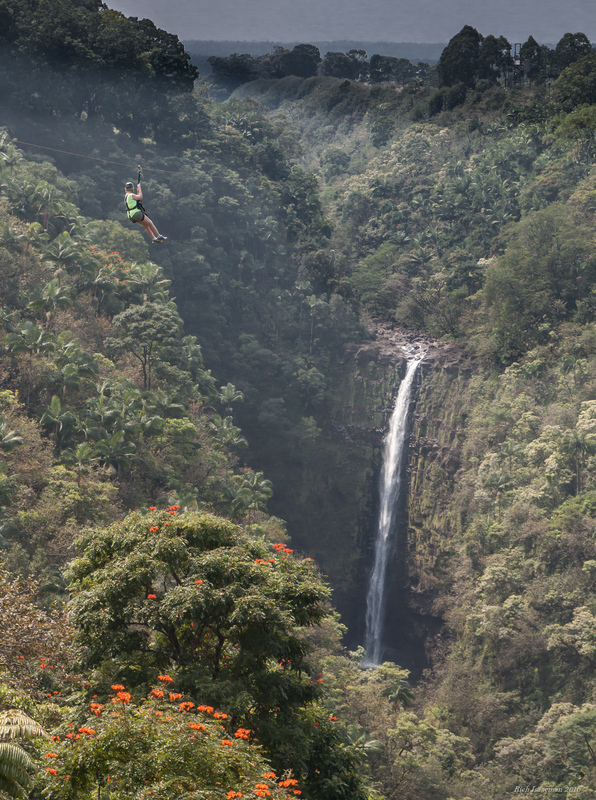 We became zipline aficionados a number of years ago in Costa Rica — which is where the whole thing started — and so of course we were not about to miss out here. 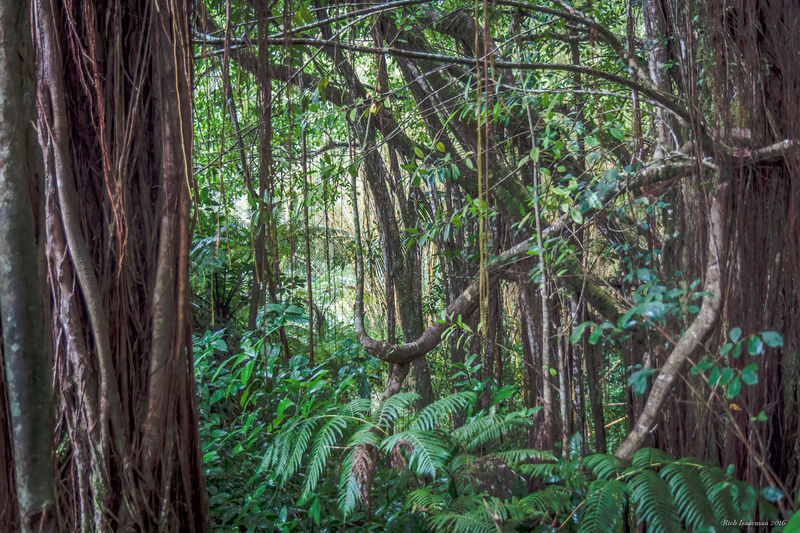 …and then they have you run off a ramp into the waiting jungle canopy. Here’s Alice again, sliding off into the distance, and waving cheerily to avoid looking down. The yellow-clad optimist at upper left is our friend Cindi, who with her husband John visited us for five days last week as our sojourn here began to wind down. What you cannot tell from the above photo is that she is moving at close to 40 mph (55 kph). You can also not hear her screaming. I promise you that this particular experience was every bit the adrenaline rush that you would expect it to be. At the end of the line (literally) our refreshments consisted of apple bananas — the little tiny super-flavorful ones that grow here — plus fresh cut sugar cane. You can’t eat raw cane (it’s got the consistency of wet bamboo), so you chew it. This is a surprisingly refreshing thing to do: crushing the cane stalk with your molars releases the sugar-laden liquid, sweet and wonderful in your mouth. 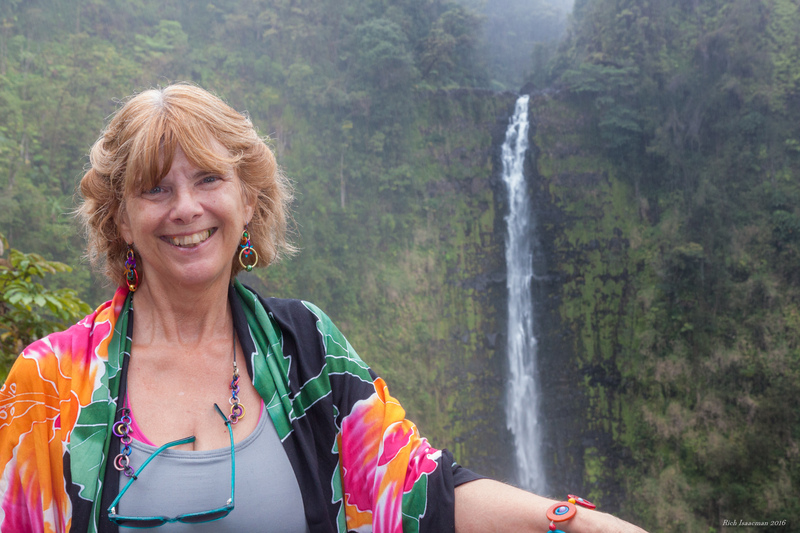 We drove away from the experience chattering like lunatics as our adrenaline levels slowly retreated to normal, then drove back to Akaka Falls itself, which Cindi and John had not yet seen. The path was a lot more crowded than the last time we were here, a week or so ago. One reason for that is that weather was better this time; another was the presence of a bus full of schoolkids visiting from Oahu. They were all wearing the blue teeshirts that you see in the photo, which show a silhouette of the battleship Arizona and the words “Always Remember the 7th of December 1941”. I have no idea what the children actually know about that particular event, nor why they were wearing those teeshirts in March; more interestingly, I also have no idea what the many Japanese tourists on the footpath thought about it. It was still early enough in the afternoon for us to make one more stop on the Hamakua coastline as we headed back to Kona, so went to Laupahoehoe Beach Park. Laupahoehoe is known for one important thing besides being difficult to pronounce by tourists, and that is a particularly tragic tsunami. 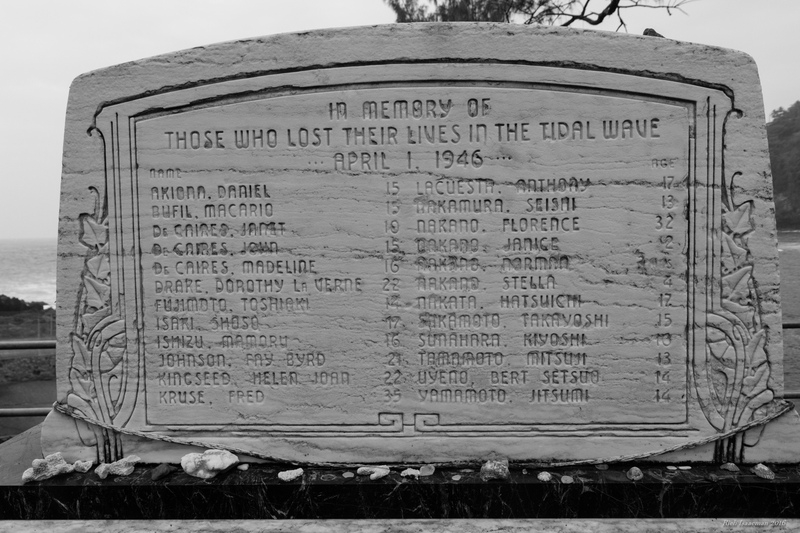 The town sat right on the coast, and the wave hit on April 1, 1946. Many buildings were destroyed, but the one that was hit hardest and suffered the largest loss of life was, of all things, a schoolhouse. 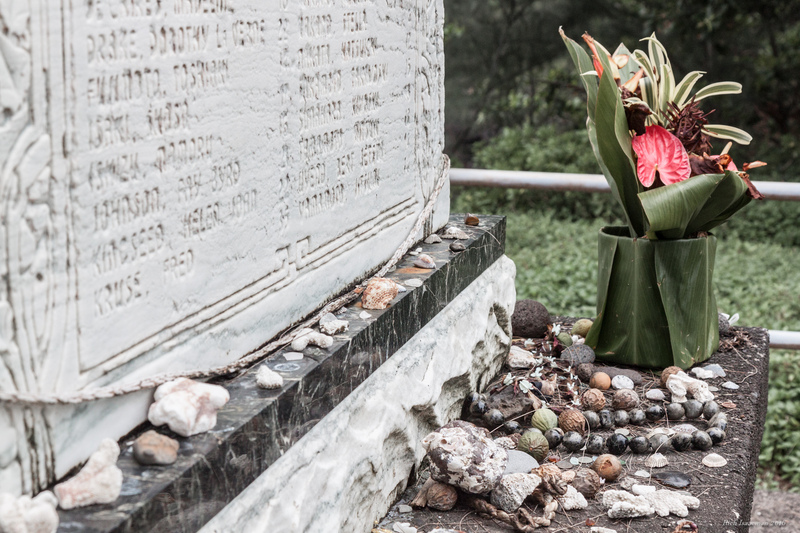 24 people were killed, most of them children, and this sad memorial marks the spot. As you can see from the list of names, whole families of siblings were obliterated. People still come and decorate it with flowers, seashells, and memorabilia. The town itself is no longer on the coast, having relocated to higher ground up the steep hillside above the highway. The coastal area is now a popular beach park where people come to camp, fish, and goggle at the wild surf. 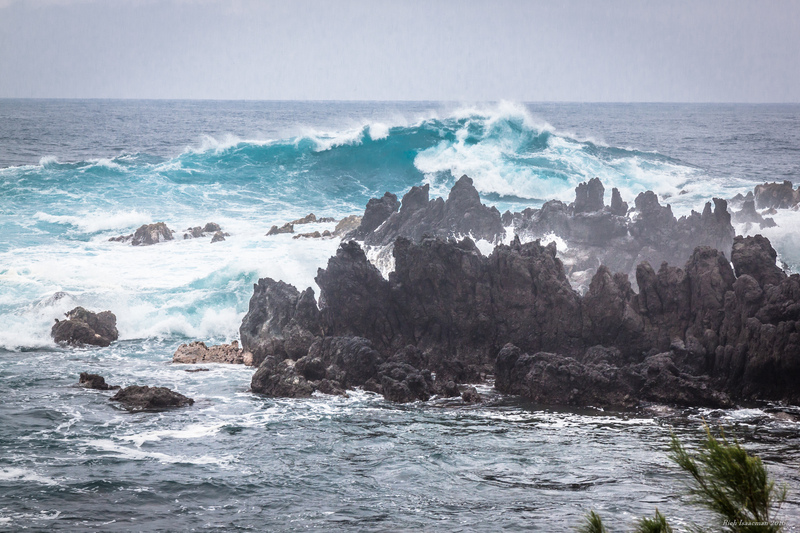 Even without a tsunami, the waves and lava rocks at this place are violent and stunning to behold. Hmmm. Seems like a bit of a downer to end this post on, especially as it is likely to be the last on this trip until we get home and post a link to the collected photos and videos in a couple of weeks; we overnight in Honolulu tomorrow, then head back to the mainland and home the day after. We’ve been gone for 5 1/2 weeks, our longest trip yet, and this stay has been such a success that we are planning on returning next year to the same house. 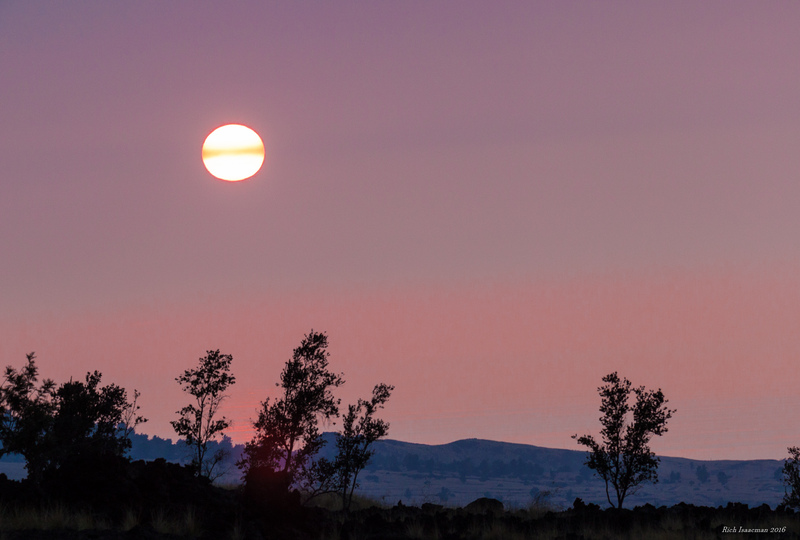 As motivation to do so, the Big Island continues to taunt us with spectacular sunsets that we can watch every night from our lanai, the open patio at the back of our rented house. I’ll close with one from ten miles up the coast, taken a few days ago. Aloha! Next stop: Japan in seven months! 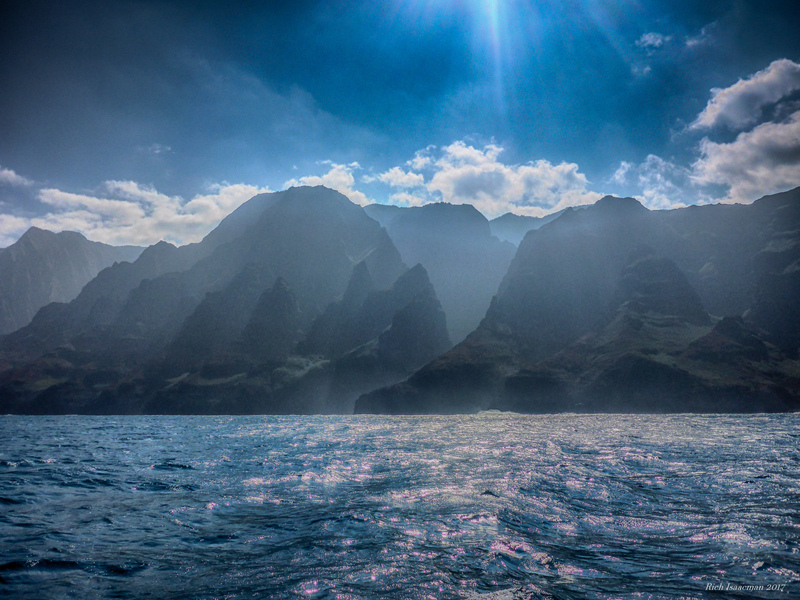 The first humans to reach Hawaii originated in the Marquesas Islands in about 300 AD, though the major wave of settlement didn’t happen until about a thousand years later, in 1200-1300 with settlers from Tahiti. Both of those groups of extreme canoeists paddled here across more than 2500 miles (4000 km) of open water, navigating via the stars, winds, and patterns of seabird flights, not only without stopping at a 7-11 to ask directions, but with the additional handicap of having only inferred that their destination even existed. It is a virtually incomprehensible feat. 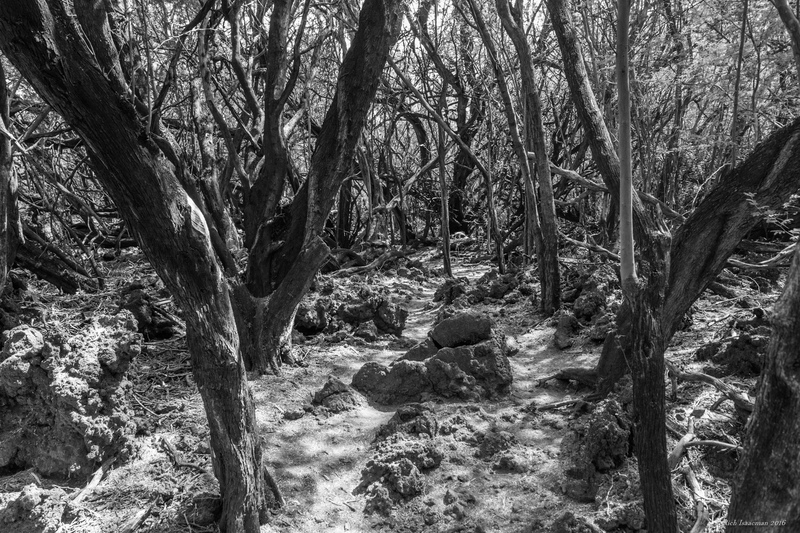 It is said — and the evidence is indirect at best — that the original settlers first made landfall at South Point here on the Big Island. They then got down to the serious business of not dying, and taking an occasional break to carve drawings into the unforgiving lava rock. 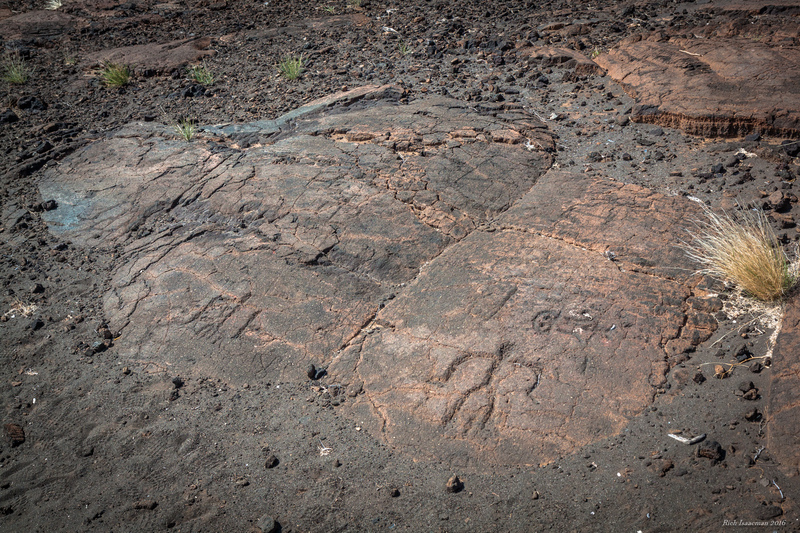 Which brings us to the petroglyphs. 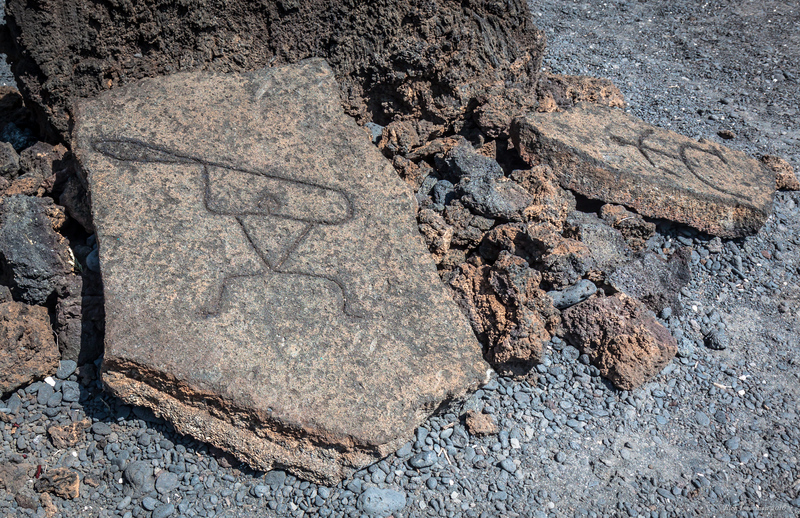 The Big Island is dotted with fields of carvings that look like this. One of the few things that one can state with confidence is that most — but not all — of the drawings are human figures. (And no, they do not look like aliens.) It’s all a little bit spooky. 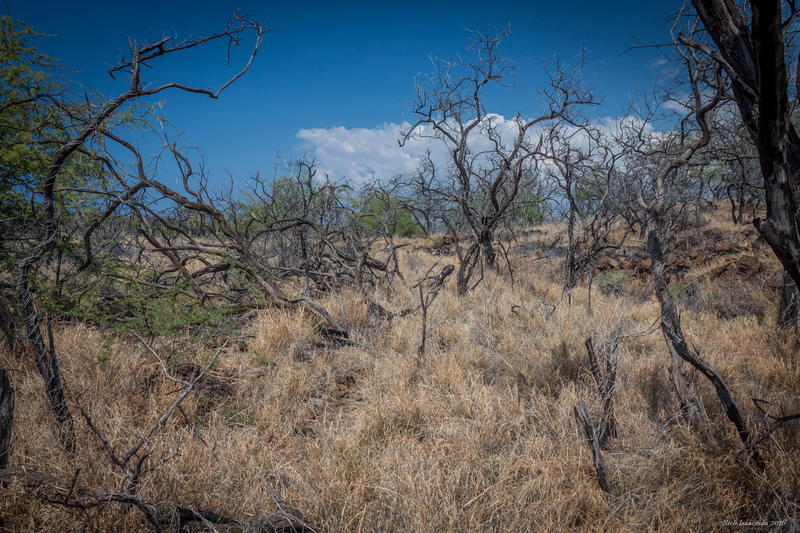 At the Puako petroglyph preserve, the spookiness is amplified by the setting, which is on a lava flow that one emerges onto after a short hike through what feels like some kind of haunted forest, along a rough path through groves of stunted and twisted trees. 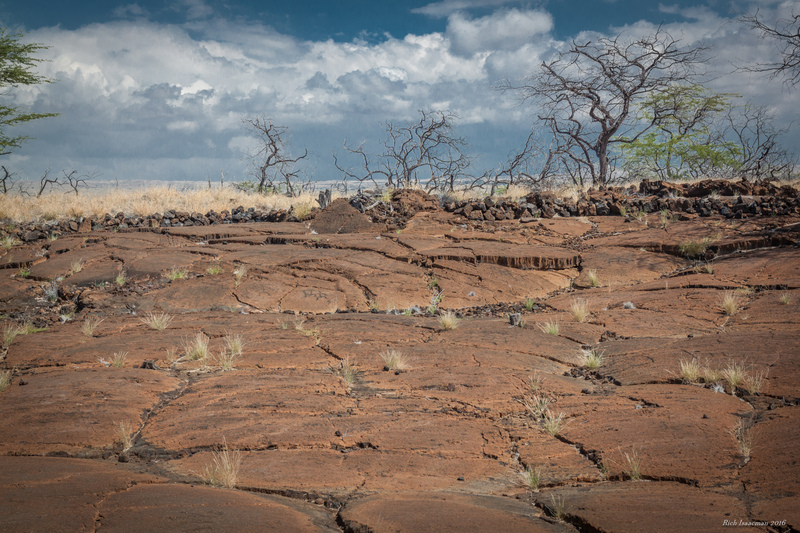 At the end of the wooded path is the petroglyph field, a lava flow about the size of a couple of tennis courts, limned with burnt-looking trees. Virtually every square foot of it has a carving. You can see a couple of them clearly in the photo below, but in fact there are hundreds if not thousands. It makes for an interesting if head-scratching outing. It’s hard not to wonder what these things are all about. 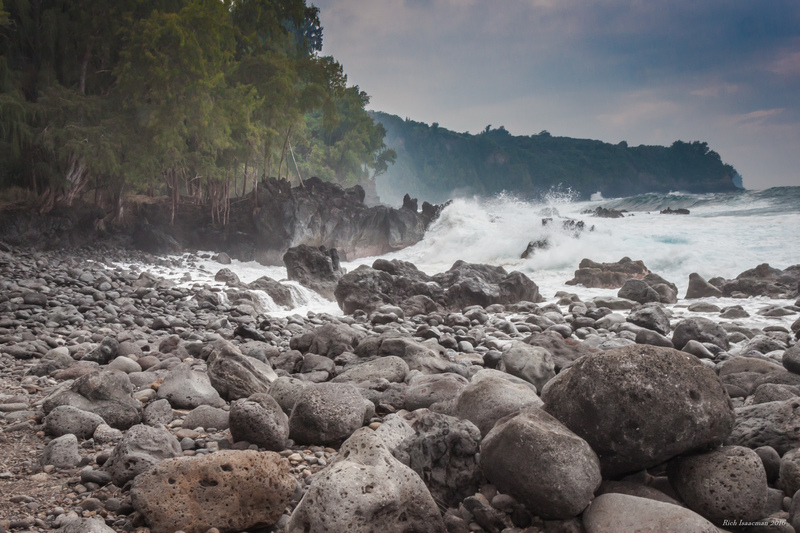 We had had a more conventional sightseeing experience a couple of days earlier on an outing to the Hamakua coast, the northeastern coast of the island that stretches between Hilo and the Kohala peninsula. It was a rainy day on that part of the island but we made the best of it, starting with a pilgrimage to the deservedly best-known purveyor of malasadas on the island, the Tex Drive In. 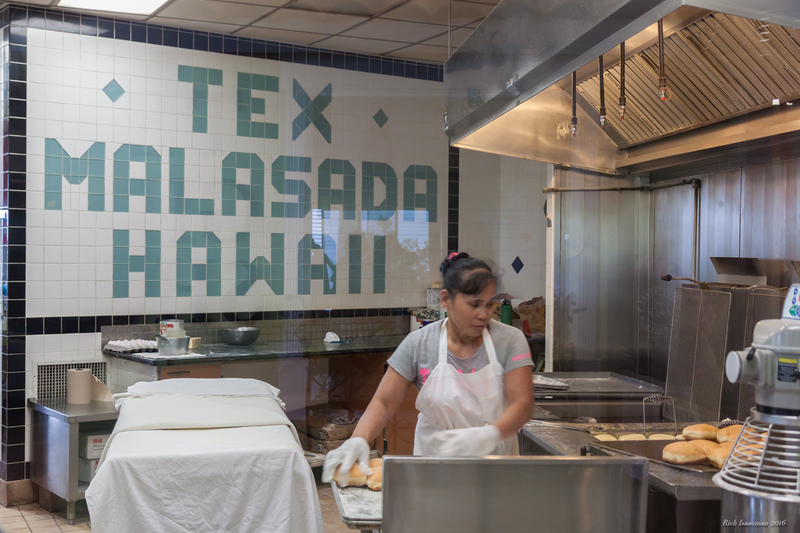 Simply put, if you have not eaten malasadas from Tex, you have not truly visited the Big Island. When I lived here in the early 1980’s, Tex Drive In was a little shack by the side of the road in the town of Honokaa. 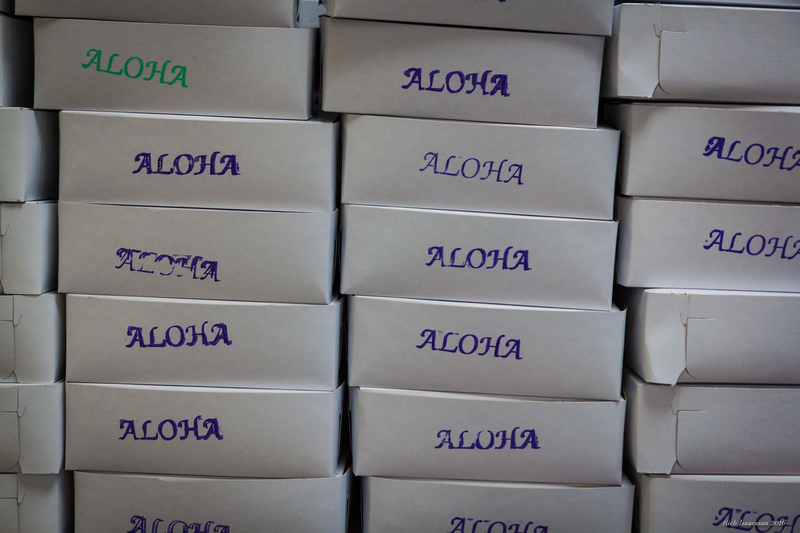 They sold malasadas and nothing else, and it is trite but true to say that people came from miles around to buy them. They prospered, and I was simultaneously pleased and disconcerted on this trip to discover that they are no longer in a little shack, though they are still by the side of the road in Honokaa. But the little shack has morphed into a grown-up building complete with a lunch menu and a gift shop. It feels a little like lost innocence but the good news is that the malasadas are still absolutely killer and cost only $1.10 each. So it’s hard to begrudge then their success. Our touring ambitions were tempered by the downpour but we did make it to Akaka Falls, a 442 ft (135 m) cataract that is one of the highest and most beautiful on the island. 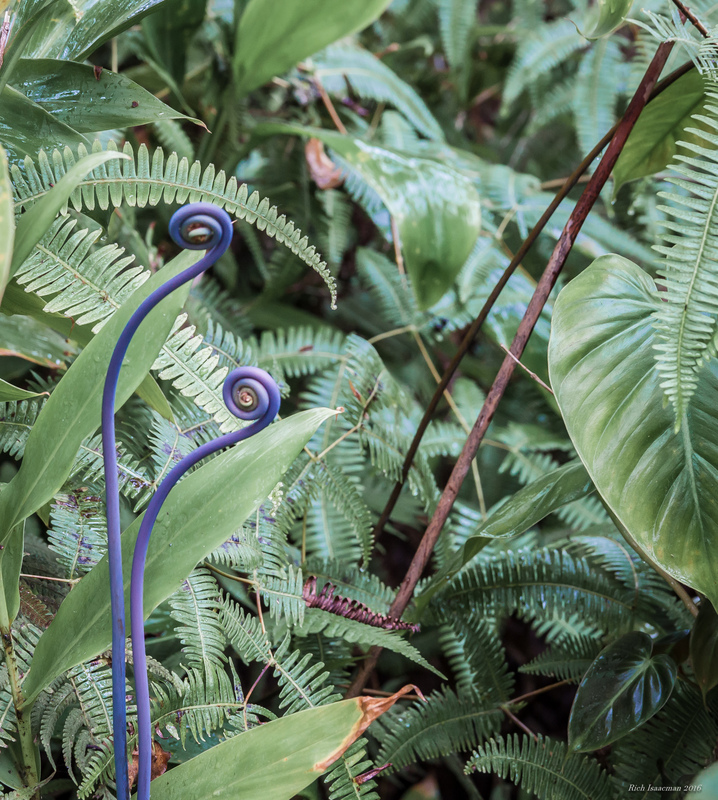 You reach it after traversing an easy paved walk along a rainforest trail — and on this particular day the emphasis was on the “rain” — whose ferns and banyans set the stage for your eventual view of the falls. It’s always been one of my favorite sights on the island; back when I lived here, one of my favorite things to do was rent a small plane and fly out to the falls, just flying tight circles above it so I could admire them from above. Now you can do that at really close range: there’s some kind of zipline tour that takes you quite close to them, and Alice is agitating to do exactly that some time in the next week or so if we can find a day when it is not raining there.